Here it is, Canal House Cooking N°2 Fall & Holiday, the latest volume in the series of seasonal cookbooks from the Canal House Studio in Lambertville that debuted last summer. Melisssa Hamilton and Christopher Hirsheimer, two very experienced food and publishing pros, have produced another winning collection of the kind of food they and their families and friends enjoy, this time for fall through holidays. With a gold gilt cover, and the same nice production details of volume N°1, this would be an ideal gift or treat for your own household (you can even buy a subscription to the series). I especially like the way the photos are styled using what look like a family’s treasured, slightly beat up, well-used pots etc. Once again, the recipes reflect the warmth of shared meals, and the rewards of home cooking. This is not, for the most part, “fancy food.” Simple roasts, braises, pies, and traditional holiday cookies are perfect for our times. The most over-the-top dish to me is a simple Lobster Stew, very New England, but guaranteed to bring conversation to a stand-still when you put it in front of your guests. And ladies, a thousand thanks for including a more-fruit-than-cake recipe, the kind you make ahead and soak with booze – you really got it right! Extra extra! 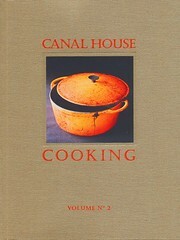 See the article in the 12/2 New York Times about Canal House Cooking!